The light uses chip-on-board (COB) LEDs to create a large illuminated surface area, making the light visible from wide angles and long distances. 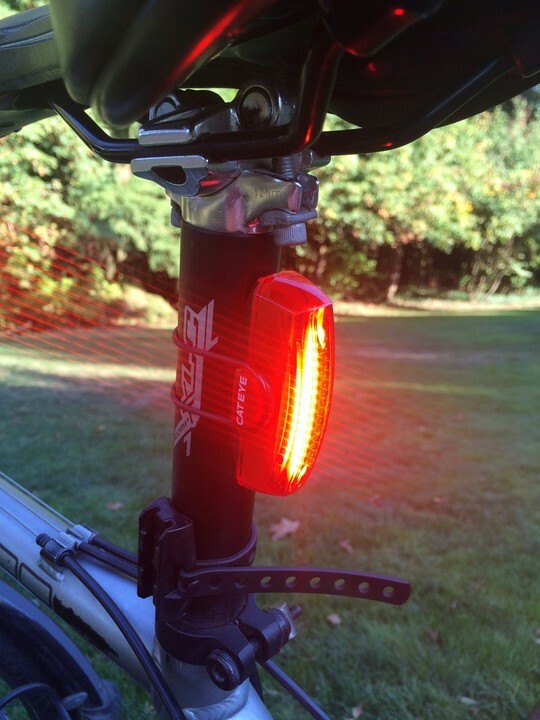 COB LEDs are becoming increasingly common in bike lights, and I think that’s a good thing. Lights with a larger surface area are easier to focus on from a large distance, even when compared to brighter lights coming from a small point source. While the Rapid X2 does not have specific side-visibility lights, the design of its lens does cause some light to be emitted to the sides. Battery life on the Rapid X2 is much better than its predecessor, but still lags behind other lights in this output range. On the 50 lm steady mode the battery lasted for 1:20 hours, and the output remained well regulated through the entire run. Other high-output lights tend to last longer, but also are much heavier – for example, the L&M Vis 180 runs for 4 hours at 70 lm, but also weighs over 3x as much. Fortunately the Rapid X2 can last up to 30 hours in some flash patterns (according to Cateye, I haven’t tested the runtime in flashing mode), which is enough to get you through more than a full day of riding. This light is designed with road cyclists in mind, and you could easily run the rapid flashing mode for a full day of road riding and still have enough battery life to keep you covered if it gets dark. For people who mostly ride in the dark, a heavier light may be worth the extra weight in exchange for a bit more steady burn runtime. The status LED on the light turns red when the battery gets low, and when about 30 minutes are remaining it will automatically switch to a low-powered flashing mode to help ensure you have light until you get home. When charging the status light will be solid red until the light is fully charged, then turn off. I would prefer that the light somehow indicate that charging is finished, for example by switching the status LED to flashing. It can be difficult to tell if the light accidentally got disconnected or is just done charging. As with most lights these days, the Rapid X2 has an internal lithium battery and charges via a micro USB cable. The charging port is underneath a rubber gasket on the back side of the light. 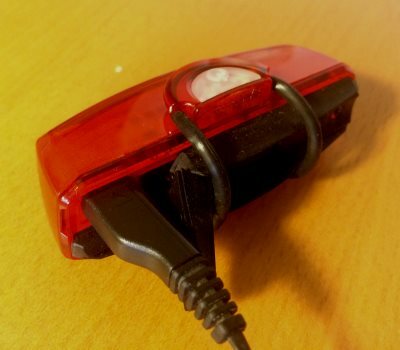 You can keep track of the rubber mounting strap (more on that in a moment) when charging by wrapping it around the light as shown in this picture. The gasket can then fold up to reveal the USB port. For some reason I’ve had more difficulty figuring out the right direction to plug in the cable on this light than on others – the shape of the port looks more symmetrical than the plug actually is, so it takes a moment to get it right. I’m also not sure whether the port is waterproof without the gasket in place. The seal is not perfect, so water could potentially get into the light here. The rubber band mount is, in my opinion, the Achilles heel of this light. Hooks are built into each side of the light, and a thick rubber band wraps around the seatpost or seatstay, connecting to the hooks. Many lights use rubber straps like this, but most are designed to be adaptable to different seatpost diameters by having some kind of spaced out holes to adjust the fit with. The Rapid X2 comes with two sizes of bands – small and smaller. The smaller band is about the right size for securing the light very snugly to a seatstay or rack. The larger band is meant for seatposts, but is far too small to comfortably fit my seatpost. I have to stretch the band to its limit to get the light on my bike, which is both inconvenient and will probably wear out the band faster than expected. This could easily be solved by including a larger diameter band, but the design is fundamentally less adaptable than a mount which can be adapted on the fly to different diameters. The angle of the Rapid X2 relative to the surface it’s mounted to can’t be changed, so if you mount on a seatpost the light will point towards the ground, and if you mount on a stay it’ll likely point up. The wide-angle visibility of the COB LEDs helps maintain the visibility even from an angle, but even so the brightest part of the beam won’t be directed towards traffic approaching from behind you. Cateye could provide a fix by including a rubber gasket which has an angle built into it, allowing the light to be mounted flush to a surface or angled depending on the user’s preference. 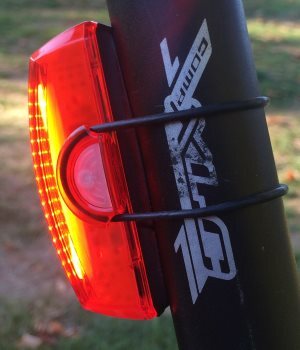 This light seems best suited for road cyclists. It’s very light-weight, slim and sleek, is daytime visible, and has a long battery life in the flashing modes. I would not recommend it for urban cycling because it’s difficult to take on and off the bike quickly, which is a must when parking in theft-prone urban areas. When cycling for transportation most people are willing to accept heavier lights to get better performance, and there are more versatile lights available for a similar or lower price. If you’re going for speed though, it’s a good choice – I’ve been using it on my new road bike and loving it.